I entered Ecuador through the Ipiales – Tulcan border crossing -, and from there I began the tour of this country, to the south. San Gabriel was the first destination, a small town that is 50 km from the border and is 2800 m above the sea level. 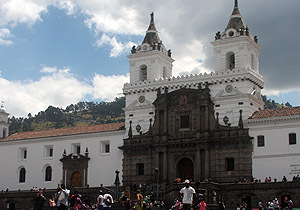 I needed 4 days to do almost 300km from there to Quito, the capital city of the country. Long slopes, which can sometimes exceed 20 km, the route is very sunny for those traveling by bike, so it is important to program the distances to cover; because if you do not, finding a restaurant for lunch can become a torture. And it is stupid. Just simply visit a website as bikemap.net , to know the km to climb and not be surprised by any infernal rise. Although my problem is that I trust, believing that the people can inform me properly. And this almost never happens. 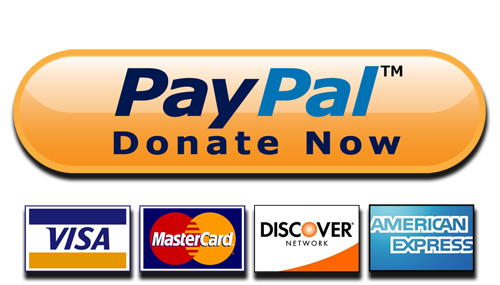 By the end of the afternoon, because I suffer much from the cold, I settled on cheap hotels that exist in most towns and offer private rooms with bath and hot water, and even with cable TV at a price that never exceeded USD 10. Upon my arrival in Quito I got lost like an idiot, once more I trusted information people and I ended up doing 15 km uphill in the opposite direction, then go back and climb another 8 km. 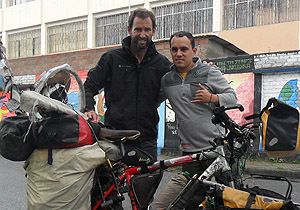 Once in the city Axel received me, an Argentine who travel by bike a trip Alaska – Buenos Aires, he fall in love with an Ecuadorian, and chose to return and live in Quito. “When I lived in Buenos Aires, every weekend with my friends planned where to go, but the distance was always a problem. In that way Ecuador is a fabulous country, you can reach the jungle, the sea or the mountains in 2 hours from the capital”. Andrea, his wife had also made a bike trip from Quito to Chile for several months, perhaps thats why I felt so comfortable with them. Axel and Andrea treated me first class. During my stay in Quito, I contacted ADRA (Association of Argentine residents) who gave me their facilities to give a talk about my trip. The Argentinien Embassy through another Andrea, helped me organizing the event and did a great job in the spread to the entire community. I was very surpise because that day just 3 or 4 of the 50 people who attended were Argentiniens. The rest, all Ecuadorians, invited by Robert, a cycling fan leading Puce, the cycling club of the Catholic University of Ecuador. And I did just fine, almost everyone buy it. Thanks Robert, Andrea and Jose Luis from ADRA. During my last days in Quito, the city was the center of protests against the government of President Correa, recording the lowest rate of support for his leadership since taking office in 2007. 46% according to the Center for Studies Data Ecuador. After a 10 days’ march from the Amazon indigenous protesters reached the center of Quito demanding to the National Assembly to file the package of constitutional amendments, such as inheritance tax and goodwill, tariff surcharge on certain imports and indefinite reelection for the President, among countless claims. My tour continued by the Mountains to Riobamba and then the Amazon, witnessing demonstrations for and against the government, blocking roads and assaulting journalists and police. On my way to Latacunga, I reach two police blockades prohibiting the transit of vehicles and authorized me to follow on my responsibility because 3000 protesters a few kilometers later had cut the road with trees, stones and sticks. Upon arrival I found at least a thousand more policemen, who did not oppose me to continue. So I got off the bike and walking I entered in the chaos of the crowd, where I was quickly intercepted. “Where you come from”, asked me a guy while another one put a stick in the rear wheel. “Do not be “malito”, I have nothing to do with this”, I said. As Axel told me Ecuadorians use much diminutives, and it would seem that the more the word decreases, the affection grows. People started laughing and after talking a few minutes they let me go. In no time I felt they wanted to hurt me, protesters had nothing against me, they were just curious. I wanted to know another side of the country and from the Saw I went to the Amazon, across the Sangay National Park. The route runs on a rise of 50 km, and more than 3600 mt altitude. That day, as every time I find a moor in Ecuador, it rained heavily and I ended up staying in a log and straw cabin 7 km from the mountain pass, where I spent one of the coldest nights of my entire trip. My God, how I suffer the cold! The next day it keep raining, it was the rainy season they explained, which is diferent to the Saw. Without wanting to spend another night in that cabin I chose to keep pedaling under the rain, with the fingers of my hands and feet frozen and so windy that at times it tugged me off the bicycle. I thought I would be able to see the lakes in the area and camping near them, but I was so naive. I was inbetween clouds and at times had no more than 20 mt of visibility. It was better in the jungle, but the route down from Sangay is very isolated, and the few houses that are in place are guarded by wild dogs. Confronting them has not been easy. The route at the eastof the country extends between 1000 and 2000 mt and crosses indigenous communities and small towns, in a constant ups and downs, it demand the biggest effort constantly. But people are very friendly, on several times I was invited to lunch or to take my purchase without paying. When I arrived in Loja, Andres received me who led the EC Cicloviajeros group, which not only promotes cycling trips with panniers, but the use of bicycles in the city through #MasaCriticaLoja. During those days Andres and Esteban had a booth at the Loja Fair and let me also expose my bike to sell my documentary. During 2014 both left their jobs and made a trip of several months to get to the World Cup in Brazil, getting sponsorships and being chroniclers for a television channel. My congratulations to the excellent organization of the project that has marked their lives. From Loja the last leg of my trip to Ecuador continued to the south. From Vilcabamba the 35 km route climbs relentlessly, to almost 3000 mt of altitude. I hit the moor again with rain and very cold, where I grabbed a leg cramp that wont let me even get off the bike. It took me 10 minutes to do so, and another 20 to walk again. I had a ball the size of a golf ball on my right hamstring. I reached the mountain pass dragging the bike, completely soaked, shivering and wondering why I do what I do. Up there I felt more alone than ever. I really need someone to help me, but there were no cars passing through. Fortunately the road went downhill for about 30 or 40 km, where I could finally find a hotel to rest. In the last 80 km to the border the dirt road was a nightmare, with many stones and slopes that are disrespectful to the cyclist. It took me two days to do it, and I suffered as a beast of burden because I was longer dragging the bicycle than pedaling. “ I travel for 14 years now”, I thougth. As a few times on my trip I began to feel that it´s time to go home. Pablo, admiro mucho lo que haces y me llena de mucha alegría saber que estuviste en mi País Ecuador cuando creí que lo ibas a descartar. Recorrer el mundo en bicicleta es uno de mis sueños y tu eres un gran motivador a que lo empiece muy pronto, siento algo de temor por lo que me espera allá afuera pero creo que lo haré. Suerte en tu viaje y espero poder encontrarme algún día con vos en el camino haciendo lo que mas nos gusta. Hola Carlos, somos Talía y Josué, ecuatorianos también. Nosotros andamos armando un viaje en bici por ECU para el próximo año. Si quieres nos podemos entrenar juntos, cruzar tips o sólo tomar un café. Nosotros estamos en Quito. Esperamos ponernos en contacto.